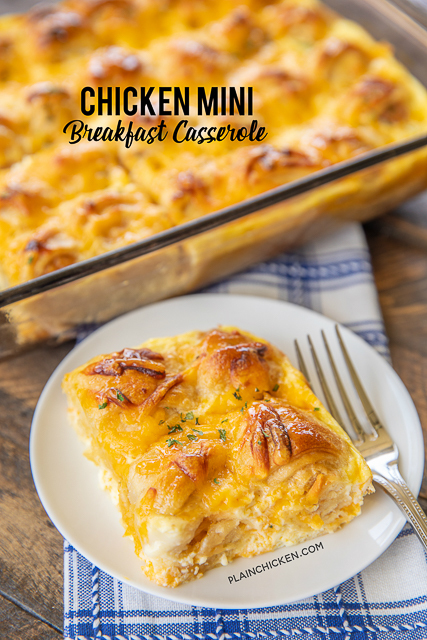 This Chicken Mini Breakfast Casserole was inspired by my favorite breakfast food - Chicken Minis from Chick-fil-a. Like a lot of people, I have a serious weakness for Chick-fil-a. I love almost every menu item. I am not usually a breakfast person, but I never EVER turn down a box of chicken minis. OMG! YUM! I was craving some chicken minis and had an eureka moment! 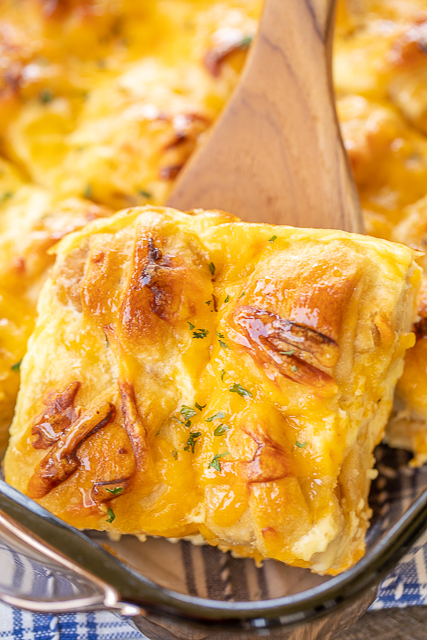 Why not make a chicken mini breakfast casserole at home?!?!? Brilliant! 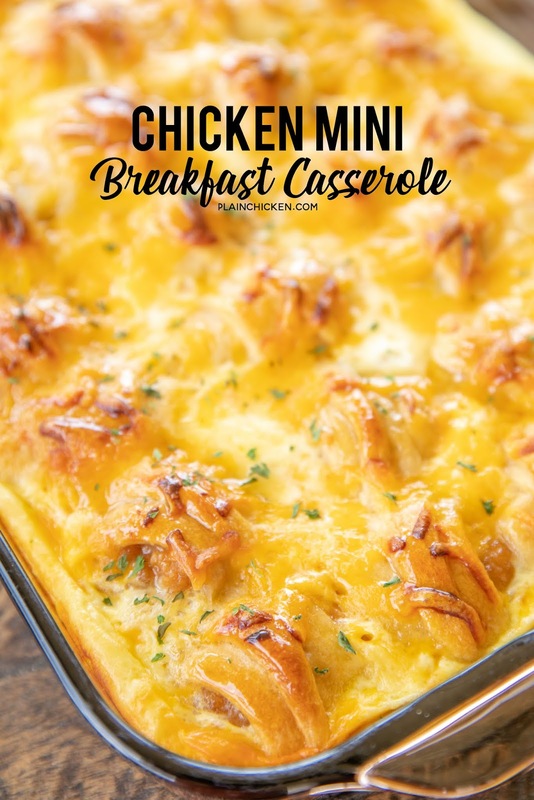 I used frozen popcorn chicken in this Chicken Mini Breakfast Casserole. There is no need to thaw or bake the chicken before wrapping it in the crescent rolls. The chicken will cook along with the rest of the casserole. We both LOVED this Chicken Mini Breakfast Casserole. SO yummy! 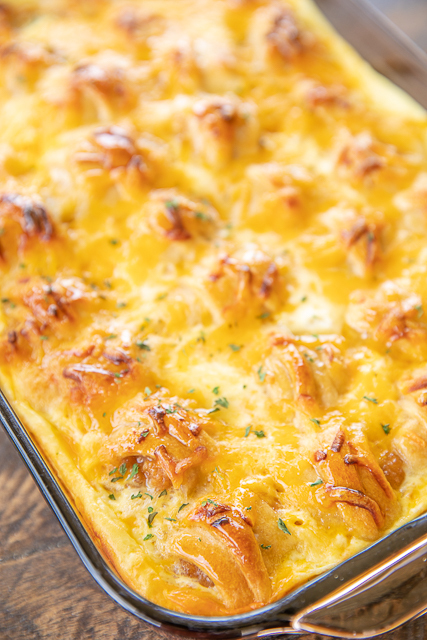 I think my favorite part of the whole casserole was the honey brushed on top of the baked casserole. You have to have that hint of sweetness so they are like Chick-fil-a's Chicken Minis!! 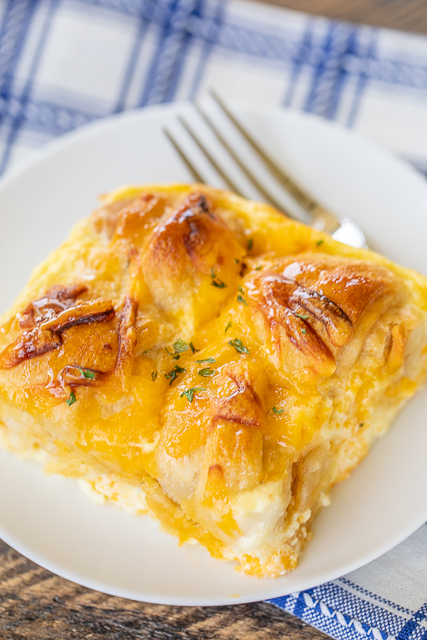 This Chicken Mini Breakfast Casserole is great for breakfast, lunch or dinner. We've eaten for all three and enjoyed it every single time! All you need is a side of fruit and/or some yogurt and you are set! Preheat oven to 375ºF. Lightly spray a 9x13-inch baking pan with cooking spray. Unroll both cans of crescent rolls; separate into 12 triangles. Cut each triangle lengthwise into 3 narrow triangles. Place one piece of popcorn chicken on wide side of each triangle. Roll up and place in prepared pan. 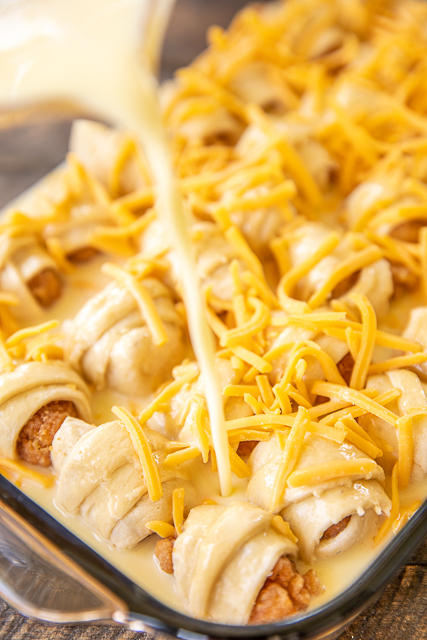 Top chicken minis with shredded cheese. Whisk together eggs, milk, salt and pepper. Pour over chicken minis. Bake for 30 to 40 minutes, until egg mixture is set. Remove from oven and immediately brush top of casserole with warm honey. This sounds great! Can it be frozen? I'm cooking for just me and couldn't possibly eat the whole thing in one sitting!! I haven't frozen the leftovers, but I'm sure that they can be frozen and reheated fine. Yum! LOVE that the chicken cooks from frozen! Such a great dish. We're sadly deprived of Chick-fil-A in my area, so I won't have to feel FOMO anymore, I can make it at home :). Thanks, Steph! Can this be made ahead the night before and cooked in the morning? I have not tried doing that so I can't say with certainty. It seems like it would work fine. If you try it, let us know how it turns out.